Click here for details about the demonstrators. Reza will demonstrate how to set a cabochon in a silver ring. The challenge is setting a soft stone in a bezel setting. The metal has to be hammered over the edge of the stone to prevent it from falling out. Learn about the advantages of setting stone versus gluing. Ever wonder if there is more to crystals and gems? How can they be used on a daily basis? Begin to develop a greater understanding of the value of gems and crystals in your regular holistic health. This conversation will cover some basic information on how to use some popular and everyday crystals in your daily life and the value they bring to being healthier. 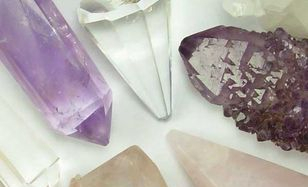 Crystal healing relates to everyone's energy fields in their body and how to bring balance to your health. All crystals have a vibrational frequency and this conversation will begin to bring more information about internal health. We will discuss the seven chakras and their importance to a balanced health. Learn how to use crystals and gems to help you through everyday life. Each of the seven main chakras contains nerve endings and are tied to major organs as well as our emotional, and spiritual states of being. It’s essential that our seven main chakras stay open, aligned, and fluid to stay healthy and strong. Concave facetting uses the technique of facetting curved facets on a gemstone instead of conventional flat facets. Concave facets increases the brilliance of a gemstone. 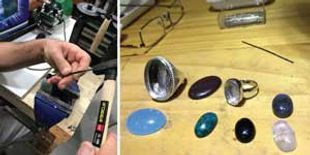 Learn the steps involved in taking a rough piece of rock and using equipment to turn it into a beautiful cabochon. A cabochon is a gemstone which has been shaped and polished to be rounded on one side and flat on the reverse, perfect for creating one-of-a-kind pieces of jewellery. Explore how an ancient craft has transformed into a modern jewellery sensation! Join Michelle Brennan from HyperLynks as she demonstrates how to use various types of metal jump rings to create stunning chain maille jewellery. 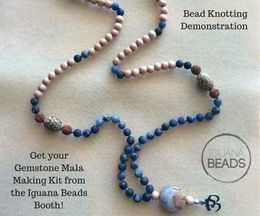 Crissy or Taylor, from Iguana Beads, will be demonstrating knotting gemstone beads to make mala jewellery. Learn about their new mala making kits. Kumihimo is the traditional Japanese technique of braiding strands of silk to create intricately coloured cords. 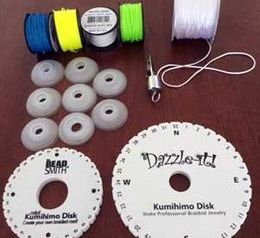 This demonstration will introduce you to the tools used for Kumihimo. See jewellery examples that incorporate beads into this lovely art form.